There are many different postcard companies, and many different types of postcards from many different eras. Postcards initially came out in the mid 1800's and continue to this day. Some postcards are very difficult to date if they are unused and have no postmark. Some postcards that are unused can be dated by the card backs and the style of the way those postcards look. The oldest postcards from the very late 1800's to around 1901 that were used for private mailing so that they could be mailed from the person buying the card to someone at home the stamp went on the back but you wrote your message on the front where the picture was. Usually there was a space on the card for writing on the bottom or side of the front of the card and to mail this type of card the postage was one cent. 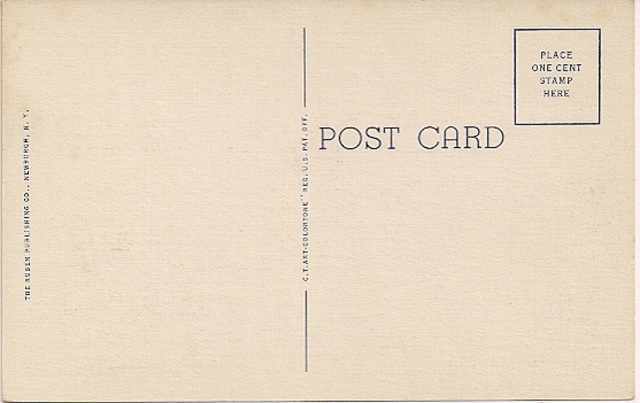 Then the Postcard changed around 1901, the word postcard was printed on the back which was an undivided back, meaning there was nothing separating the sides for address and notes because you still wrote your notes on the front and the address went on the back. I will go further into the changes to the postcard in another post, but for now I'd like to discuss the Curt Teich Postcard Company. The Curt Teich Postcard Company was started in Chicago Illinois in the late 1800's and closed down shop I think around 1978. As someone that likes to collect, look at and sell postcards, Curt Teich is one of my favorites not only because of the look, but if the card isn't used and has no postmark on it, it is easier to date. Here is an example of a card that is unused and I wouldn't be able to date accurately without a postmark. And this is the same card on the back, as you can see no real way to date it without a postmark, except for the neat and handy dating numbering system. On the back of this card is a good example of a divided back, where the message went on one side of the card, and the address on the other side just under where you'd put the postage stamp. So not only is the style of the Curt Teich Postcard one of my favorites, I find the Card Numbering system especially useful in helping me to date my cards and cards we want to put on the website. Sometimes there is just no way for me to date a postcard accurately so what I will do is first look at the backs to see the style there, if there is no copyright date, I look at the address of the Manufacturer, sometimes it will list an address and it will be an old style address such as : E. F. Clements, 1120 Mission, San Francisco 3, Calif - the postal service didn't go to the current Zip Code System like 1120 Mission San Francisco California 94103 until the early 1960s. Sometimes the postmark is faded, but you can go by what the postage is on the card or which stamp was used. Another method is to look at the buildings and even better the cars if any on the front of the cars, where you can at least narrow it down some. So if you can't get an exact date on a card or exact year, you can kind of narrow it down somewhat to a general decade or so. The chrome cards which are what we mostly see now, came into the postcard market around the late 1950's to early 1960's, and that's when the linen postcards seemed to have disappeared.